Full details have been released of the NUS democracy cuts, which look set to block almost all remaining opportunities for ordinary students to control or influence what the union does. NUS will be stripped back into a “lean campaigning machine” that scraps the majority of its committees to “ease the burden of participation” on members and lifts all the democracy from its conference to solve the problem of a lack of engagement. There will be fewer, shorter, less political conferences and the five Liberation conferences (Women’s, LGBT+, Trans, Black and Disabled) will be merged into one singular ‘Liberation Conference’. All full time liberation officers, committees and sections will be cut. Students unions will no longer be required to hold cross campus elections to decide their delegates to National Conference. Instead SU executive teams can simply appoint “suitable” delegates. Consensus-based decision-making in workshops will take precedence over motions debates and democratic votes. There will also be online votes for student unions pre, during and post conference. NUS staff will be able to add details into motions explaining their financial and operational impact, making it easier for management to veto motions on bureaucratic technical grounds. Full time officer posts will be two years long and their campaign priorities will be limited to a single ‘NUS manifesto’ adopted by the whole officer team. The National Executive Committee who hold them to account will be scrapped. NUS UK will be split into two separate arms: ‘Student Voice’, which works as described above, and ‘Student Union Development. All control of SU Development will be given to student union executives (in most cases this means SU CEOs). Students will no longer be able to amend NUS’s articles of association [its constitution], nor vote to approve members of the Trustee Board. The leadership’s motion claims that there is a “clear mandate” for these reforms. But they have been drawn up without the consent or knowledge of the vast majority of NUS members by a ‘Turnaround Board’ made up of select (right wing) full time officers, NUS’s CEO and other student union CEOs, plus a ‘consultation process’ of student unions with no mandate from general assemblies. Delegates to National Conference, on 9-11 April in Glasgow, will vote on a motion presenting the reforms, but in the spirit of the undemocratic way the whole process has been handled, they won’t be able to actually amend the proposed new articles of association. 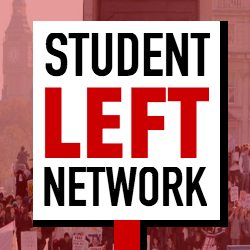 The Student Left Network will be campaigning at conference against the reforms and for a fighting, democratic NUS that leads mass campaigns in defence of students’ rights, controlled and decided by its seven million members, not its 600 student union CEOs.